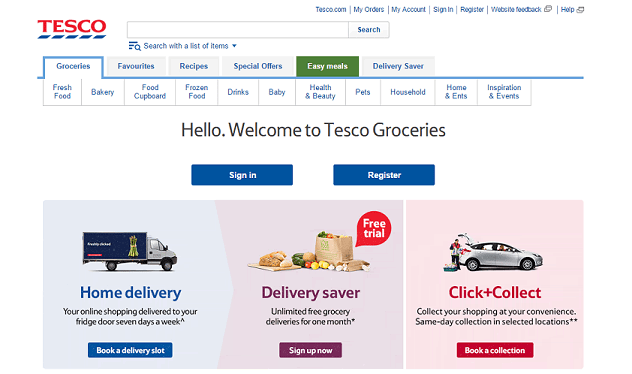 Sign up for free and just shop with Tesco Groceries as normal. Our average member earns over £300 cashback a year. If the purchase amount does not exceed the minimum spend limit of £45. Please be aware that in the instance that a customer is not a true “new customer” (for example they create a new email address but have previously shopped), the commission will not be awarded. If you have previously purchased a grocery shop online from Tesco. Tesco Groceries cashback can be earned simply by clicking through to the merchant and shopping as normal. Tesco Groceries Cashback is available through TopCashback on genuine, tracked transactions completed immediately and wholly online. Save money when shopping for your groceries at one of the UK's supermarket giants with these Tesco voucher codes and cashback deals. Whether you are buying fresh food & drink, items for the freezer, household items, essentials for your child or pet products, you will find a vast selection of items which you can buy online and have delivered right to your door, or you can order your shopping online and then pick your groceries up yourself with Grocery Click+Collect. Collect points when you shop with their Tesco Clubcard scheme, which will be converted into vouchers which you can make go further thanks to Clubcard Boost. Sign up to TopCashback using the form you will find further down this page and start saving today. Their range of fresh produce includes everything from milk, fruit and vegetables to meat, pizzas and desserts - all of which you can save money on with our Tesco discount codes. Buy bakery products such as bread, cookies and cakes, as well as tinned food, crisps, cereals, pasta, chocolate and frozen food. Tesco is also a great place to find all of your baby essentials, including nappies and food, while their health & beauty selection includes everything from skincare and haircare to vitamins and medicines from leading brands. Browse household essentials like cleaning products, light bulbs and laundry items, while when it comes to entertainment, you will discover books, CDs, DVDs and toys. Shoppers can pick up a Tesco saving on their first online order when they shop through TopCashback, and if they’re looking to be extra savvy, then further money off deals can be had by shopping smart. When you head on over to the Tesco Grocery website make sure to take a look at the special offers section accessed via the option on the menu. It’s here where you can browse through all of Tesco’s deals and easily sort them by category, brand or dietary requirement. Typical offers include the likes of half price, multibuys, buy one get one free and lines for only £1. Currently, you can also check out the great value section of the site. To celebrate one hundred years of Tesco, you’ll discover a range of goods at super low prices, and available on top brand essentials. Don’t forget that Tesco also offers their Clubcard reward scheme allowing you to collect points to earn money off future shops. More importantly, if you fancy saving elsewhere, you can use the Clubcard Boost option to get vouchers to use at partner restaurants, cinemas and theme parks. See further down this page for more details. While ordering online makes for great convenience, you will be charged for delivery; you can, however, opt to click and collect which is free. If you want your groceries direct to your door, then you can still reduce the cost with Tesco’s Delivery Saver service. By paying for a one or six month plan you can get access to unlimited delivery with some plans even including same day, it’s worth investigating if you intend to order regularly. Finally, remember you can save money and the environment by selecting the bagless option when placing any delivered or collection order. Try their Anytime Delivery Saver Plan for a month and enjoy free deliveries seven days a week, whether you are shopping for groceries, Tesco Direct items, F&F clothing or Tesco wine By the Case, while when the free trial ends, you will automatically move onto a plan of your choice. The benefits of signing up are that you will enjoy unlimited grocery deliveries on orders over £40 and free next day delivery on Tesco Direct and F&F orders over £10. Not only can you be sure you will never be out of pocket thanks to their Delivery Saver Guarantee, which will see them give you a grocery eCoupon for the difference if your plan costs more than you would have spent on delivery charges, but you will also benefit from free next day Click+Collect on Tesco Direct and F&F orders over £10, as well as free next day delivery on Wine By the Case orders. For when your free trial ends, you will need to pick from their six or 12-month Anytime and Midweek plans, though you can switch or cancel anytime during your trial. Use Grocery Click+Collect and you can enjoy the benefits of shopping online with the added convenience of being able to pick it up at a time which suits you. Place your order on your desktop, or via their mobile app, without having to visit the store and choose to collect it from more than 320 locations, including Tesco stores and local businesses. Next day collection is available after 8am, while more than 250 locations offer same day collection Monday-Saturday. Order by 9am and you can pick it up after midday, while as long as your order is placed by 1pm, it will be ready for collection after 4pm. Either sign in or register, while if you already have a Clubcard, enter your number when you register and you will be able to see all of your shopping in the 'Favourites' section to help make your first shop easier. To book online a slot, choose the Grocery Click+Collect option and choose your location. You will be shown the closest collection points to your home address, but if you want to collect elsewhere, you can enter any postcode when selecting a collection slot. Start shopping using your favourites, while if you do not have a Clubcard, you can use multi-search to search for a list of items or browse the special offers page if you want to see the best deals. Once you have done a few shops, you will find your regular items in 'My Usuals', or you can use 'Last Order' to access the items you bought the time before. You can also create a list of items which can be added to your basket at once, while you can amend an order up to 11.45pm the night before you want to collect it (1pm for same day orders). Then, just pick up your groceries from your chosen location during your time slot. Every time you do Tesco online shopping, you will earn Tesco Clubcard points. Every three months, they will send you vouchers based on the amount of points you have collected, which you can use to make savings when you shop in store, on the Tesco website or at the pump. Alternatively, with Clubcard Boost, you can make them go even further as they have teamed up with many great partners, including Alton Towers, Odeon Cinemas and Topps Tiles, to allow you to get up to four times the value of the Tesco vouchers throughout the year when you use them on everything from eating out to enjoying a day out with the family. Just choose a Clubcard partner online, add it to your basket and enter your voucher codes during checkout. They will send you an email confirmation and either post your tokens to you or deliver them to your inbox. Tesco.com are dedicated to making sure your receive great quality products and customer service. Not only do their expertly trained shoppers always pick the freshest produce with the longest sell by dates, but they also carefully select fruit and vegetables as if they were shopping for themselves to ensure you receive shopping of the highest quality. When shopping online, you will also have the chance to provide details of specific substitute products and include notes for the picker. When it comes to packing your online grocery order, their team is trained to separate food from non-food items, as well as chilled products from frozen ones, while heavy items will be placed at the bottom. All products are stored in climate-controlled areas, including in their vans, which means your shopping will be delivered in great condition. The driver will deliver your shopping to wherever you choose, whether it be the front door or your fridge. Whenever you place an order via the website or app, you will see that the total cost will be displayed as a guide price. This is due to the fact that between placing your order and delivery, there may be new promotions or other price changes which will affect some items in your basket. Also, loose products like fruit and vegetables are charged by weight, which means the price of them may vary depending on the items picked for you. Pre-packed weighted items, such as meat, poultry and cheese, could also vary in price, while if any products you have ordered are not available and you have requested substitutions, the alternative may have a different price. Download the Tesco Groceries app to your iOS or Android device from the App Store or Google Play and you will be able to browse, shop and change your order wherever you are. If you are browsing on your device, just tap the button and follow the instructions to download the app onto it, while if you are on your computer, you can scan the QR code and then follow the instructions. Once you have the app, you will be able to see all of their special offers, shop quickly from your favourites and check out securely. Make changes to your order on the go or find a Tesco store near you and view opening times. Be inspired by recipes and add the ingredients straight to your basket, use Clubcard e-coupons and vouchers and benefit from quick access to Tesco Direct and Clubcard. Welcome to Tesco Groceries. Earn Clubcard points and save money when you do your grocery shop at Tesco.